Northeastern Chimney, Inc. and our CSIA certified chimney sweeps provide chimney sweep services to Rocky Hill CT and all of Hartford County in Connecticut. From chimney inspections and chimney restoration to chimney cap installations, chimney relining, and more, we cover the full spectrum of chimney maintenance needs. Thanks to our high standards of work and outstanding customer service, we have gained thousands of satisfied customers throughout Rocky Hill CT, Windsor Locks CT, Wethersfield CT, Newington CT, and Berlin CT. Many return to us year after year to handle their annual chimney inspections and chimney cleanings. There are plenty of reasons why we’ve become the local chimney sweep of choice for Hartford County! As good standing members in the National Chimney Sweep Guild, we are able to stay current with all the best practices, products, and standards for the industry. Throughout Rocky Hill CT and along Interstate 91, Rt 2 & Rt 99, our distinctively marked company vehicles can be seen as they travel on their way to provide residents with chimney sweep services like chimney restoration, chimney liner installation, chimney inspection, masonry repair, and chimney waterproofing. Since 1984, Northeastern Chimney, Inc. has built an outstanding reputation with locals for providing quality work at fair prices. Our courteous and professional crews will always arrive to the job site on time, in a company uniform, and in a clearly-marked company truck. Our company is fully insured to work on your home and our techs are highly-skilled and completely capable of handling even the most complicated chimney repairs. Residents have come to trust in us to always provide a quick & fair written estimate and to thoroughly explain any recommended services or repairs with the homeowner. Residents in Rocky Hill CT regularly turn to us for chimney repairs & maintenance since we stand behind the work we complete. Buyer beware! Unknowing homeowners have become victims of a common chimney sweep scam. 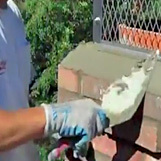 There are a number of unscrupulous “chimney contractors” who prey on unsuspecting homeowners. They promise low, “too-good-to-be-true” prices on common chimney sweep services like an inspection or cleaning. Most of these “contractors” are neither trained nor certified, which can be very dangerous. They show up at your home to perform a cursory inspection, but their whole goal is to attempt to upsell homeowners into expensive repairs or services. Never agree to any expensive services that you are unsure of. Many times the “required” services aren’t even needed, but most homeowners are unaware of the current condition of their chimney system so they trust the fake “sweep” at their word. Always get a second opinion from a reputable chimney contractor and remember to always ask for references & check BBB ratings before hiring a chimney sweep. Make sure to keep the safe operations of your fireplace, stove, chimney and venting system a top concern. Trust in the professionals at NEC to deliver top-notch chimney sweep services. Top Chimney Sweep company of Rocky Hill CT offers the best chimney services in Central Connecticut and Hartford County.